The cool looking dog is mine. Envy meters are spiking all over town. I am drooling. 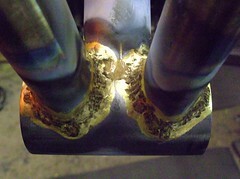 How are you brass brazing, torch or TIG? That bottom bracket looked much better after you cleaned it up. Good job, I can't wait till I can start doing this stuff. Also can't wait to see the finished product.